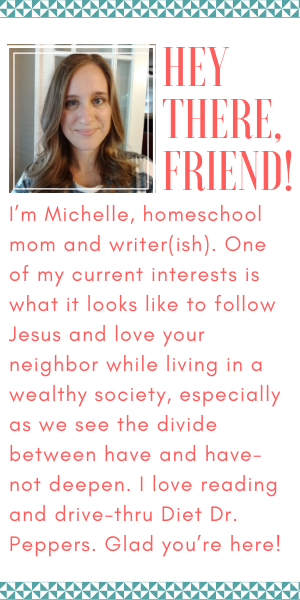 If you’re looking for a good homeschool rabbit hole to fall into, Mystie Winckler’s Simply Convivial blog is a great one. I’ve gleaned so much and been totally overwhelmed with all that she does and shares–but it’s her EHAP approach to tidying up the house with kids constantly living in it that really hit home. EHAP stands for Everything Has a Place. As she describes it, Mystie grabs a timer and her kids, heads to one of three “sections” in their home, and everybody sets to work for 5 minutes; then, they move together to the next section so that the whole house is tidied at the end of the day in 15 minutes. While I had already added afternoon chores to our days, sending Claudia to tidy the living room and Ellie to tidy the dining room, there was a lot of consternation involved. One would need to use the bathroom…and be in there 10 minutes. The other would want to listen to her headphones…and it would take ages to find them. I would try to clean the kitchen (and, if I’m honest, scroll my phone some days) so that I wasn’t policing the cleaning. Now, we’ve changed it up. Roger races to the hallway–and I follow him. We check for what can be picked up and manage any grumpy attitudes about being almost four and having to help. We check the bathroom, tidy it up, sometimes grab Lysol wipes to wipe it down, and BAM! In about 1.5 minutes, one kid is done EHAPing. Our house is more frequently in order, and it’s hard to be grumpy when we’re trying to move at a fast pace (though I have talented children, so they still manage it some days). And in 5 minutes, it’s over. The main areas are more orderly, which makes us all feel better, even though we wouldn’t recognize the clutter as problematic before it’s picked up. What does tidying up look like at your house?